A world known to its inhabitants as Scarn, the Scarred Lands is a place of dynamic heroism, supreme villainy, and incalculable magic. Torn and twisted by battles between the titans and their children, the young gods —fought largely by monstrous titanspawn pitted against humans, elves, dwarves, and other “divine races” — Scarn is a world still wounded deeply by the Divine War that took place less than two centuries ago. The Scarred Lands has been a favored d20 system fantasy setting since the release of the Creature Collection in 2000. 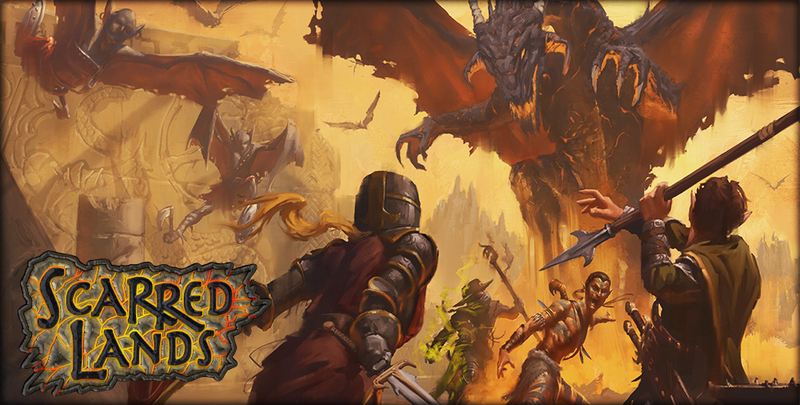 Over the next several years, over 40 titles were published for the Scarred Lands, making it one of the most fully supported fantasy RPG settings ever and the premiere product line of the former Sword & Sorcery Studios. Now, Onyx Path Publishing seeks to bring this cherished fantasy setting back to your gaming table! If this sounds interesting to you, head over to our DriveThruRPG storefront to get the all-new Scarred Lands Players Guide for 5th Edition OGL or for Pathfinder! Scarred Lands merchandise is available via our RedBubble store. Now Available: Scarred Lands Journals!